Enhance the look of your living space with the contemporary styling of this art deco inspired TV stand. 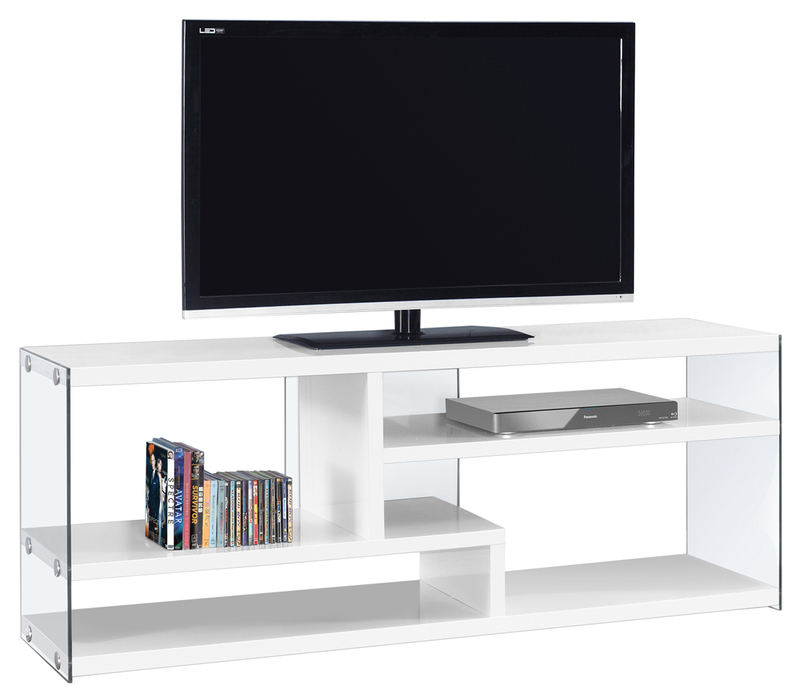 Constructed with thick panels in a brilliant white finish, this stand features open concept shelving and a storage drawer ideal for media storage solutions. This stand will accomodate up to a 47" flat panel TV. 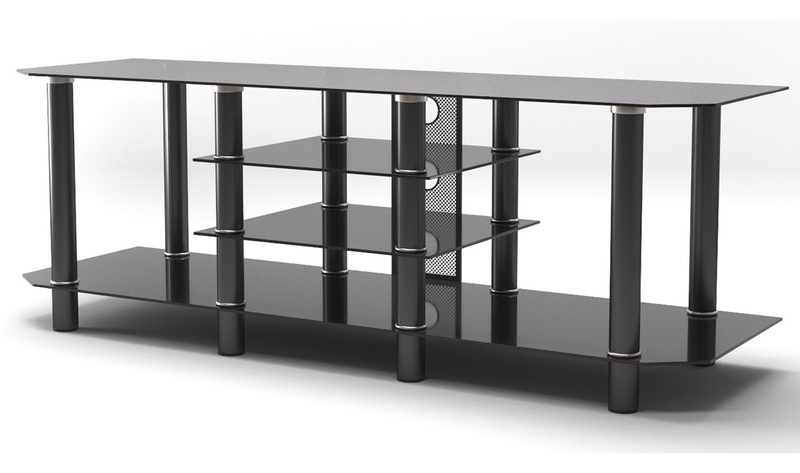 Enhance the look of your living space with the contemporary styling of this art deco inspired TV stand. Constructed with thick panels in a dark taupe reclaimed-look finish. this stand features open concept shelving and a storage drawer ideal for media storage solutions. This stand will accomodate up to a 47" flat panel TV. This 48" long TV console will be a fashionable addition to your living room, offering clean lines and ample storage space. 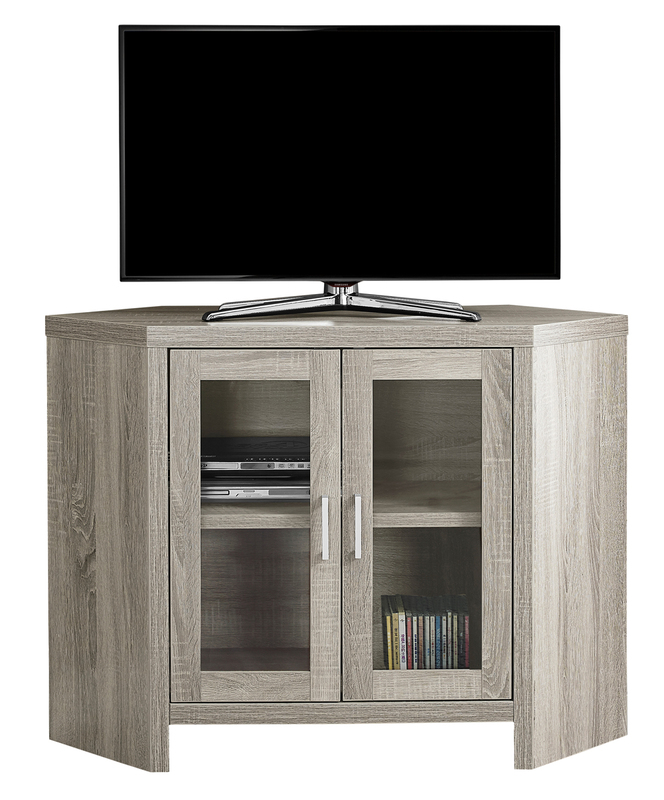 The transitional style TV stand has a dark taupe, reclaimed, wood-look finish and wide surface for your television. Three open shelves in the center are ideal for placing electronic components, as well as the side shelves are great for storage of movies, games, or decorative pieces. For a perfect finishing touch, this lovely piece is completed with tapered legs, and will blend effortlessly with any décor. 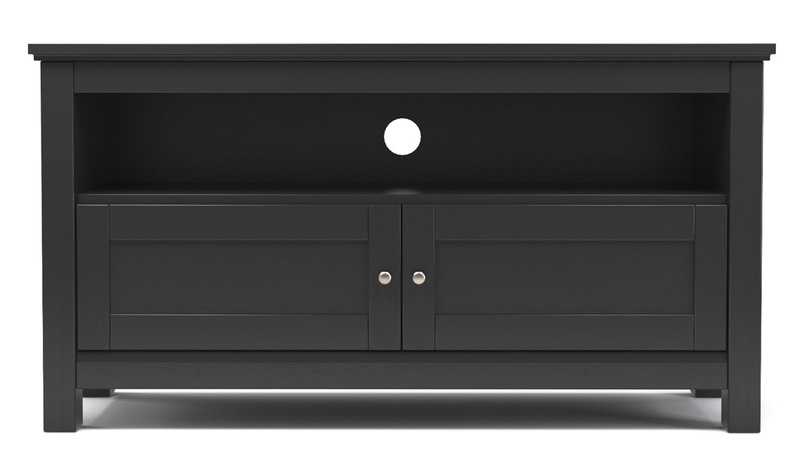 Modernize your space with this contemporary, glossy black TV console with rounded edges. Featuring a solid 60"L top and a tempered glass shelf, this durable, glossy black finished console fits perfectly with any design to showcase your collectibles. This piece can easily match with any living space and gives a clean, sophisticated look while you entertain your guests. 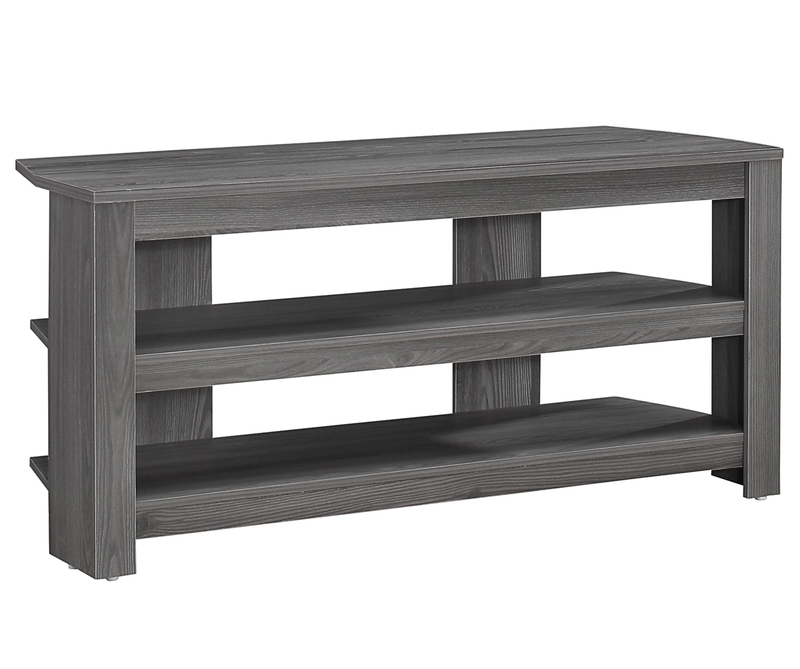 What's old is new again with this urban reclaimed ash grey and black 70 in TV stand. 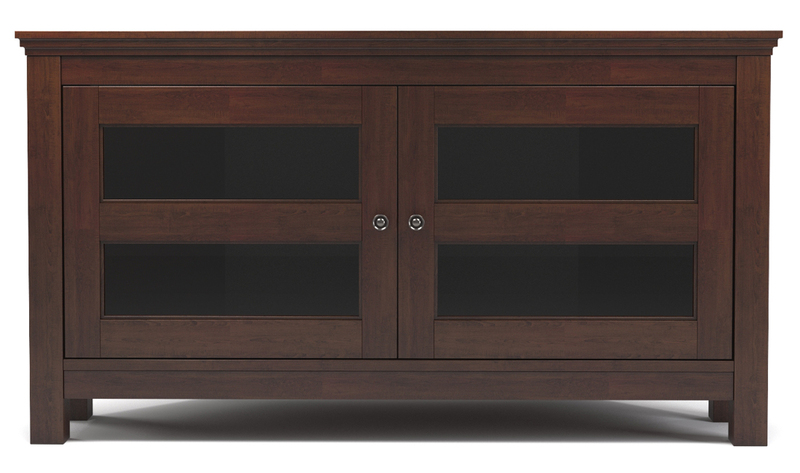 Console features four drawers and a concealed cabinet for ample media storage. It's vast size combined with style and functionality accommodates most flat-panel TVs up to 70 in. Constructed of powder-coated steel and ash grey wood, this desirable TV stand offers a beautiful two-toned finish. Solid, sturdy stand supports 250 lbs. 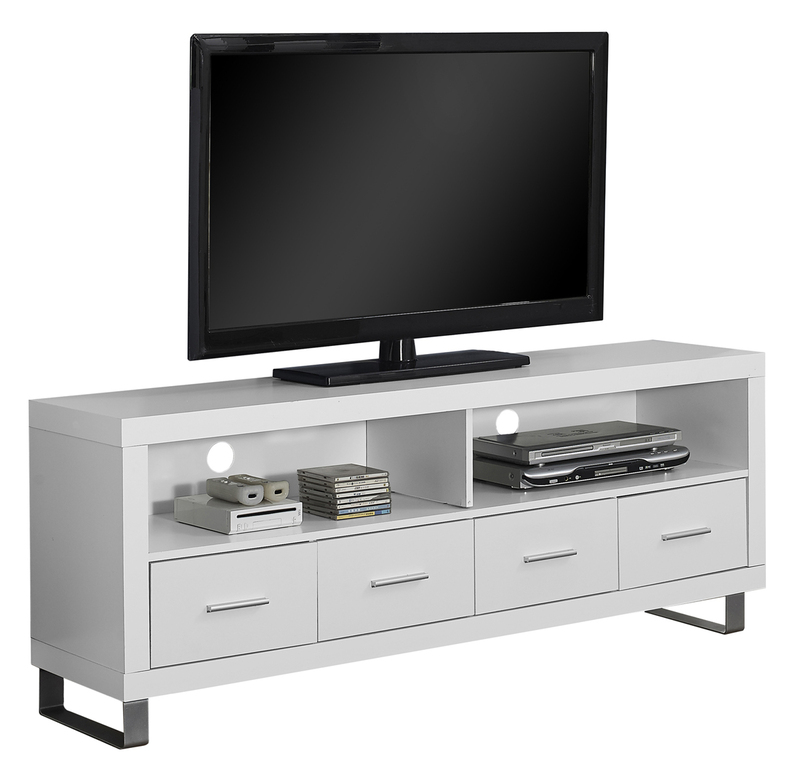 Modernize your space with this contemporary, glossy white TV console with rounded edges. Featuring a solid 60"L top and a tempered glass shelf, this durable, glossy white finished console fits perfectly with any design to showcase your collectibles. This piece can easily match with any living space and gives a clean, sophisticated look while you entertain your guests. Get ready to add that wow factor to your contemporary living space with this uber sophisticated TV stand finished in glossy white, featuring thick panelled fixed shelves to accommodate all your media components, and accented with 8mm clear tempered glass sides giving it that modern airy appeal. This style worthy TV stand can accommodate up to a 60"L flat screen television. Assembly is required. Complete the look of your living space with this contemporary two tone TV console. The thick paneled black frame paired with grey cabinets are accented with sleek silver colored handles and supported by stylish silver legs. Featuring two open storage shelves and two double door cabinets, this TV stand will meet all your media storage needs in style. 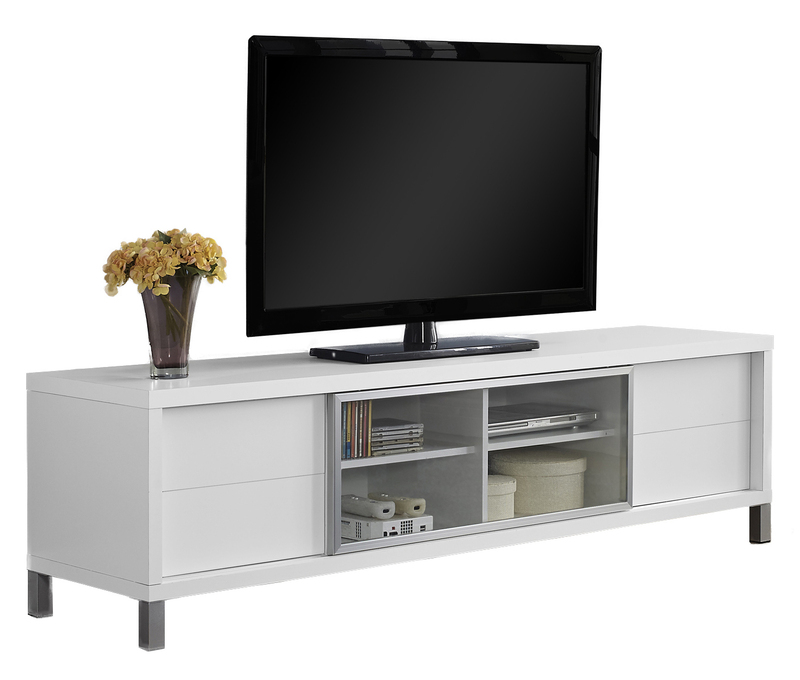 Modernize your space with this open-concept, bright white contemporary TV console. With a thick panel design and 5 open concept shelves perfect for storing electronic components or displaying your favorite decorative items, this piece is a must have in any home. 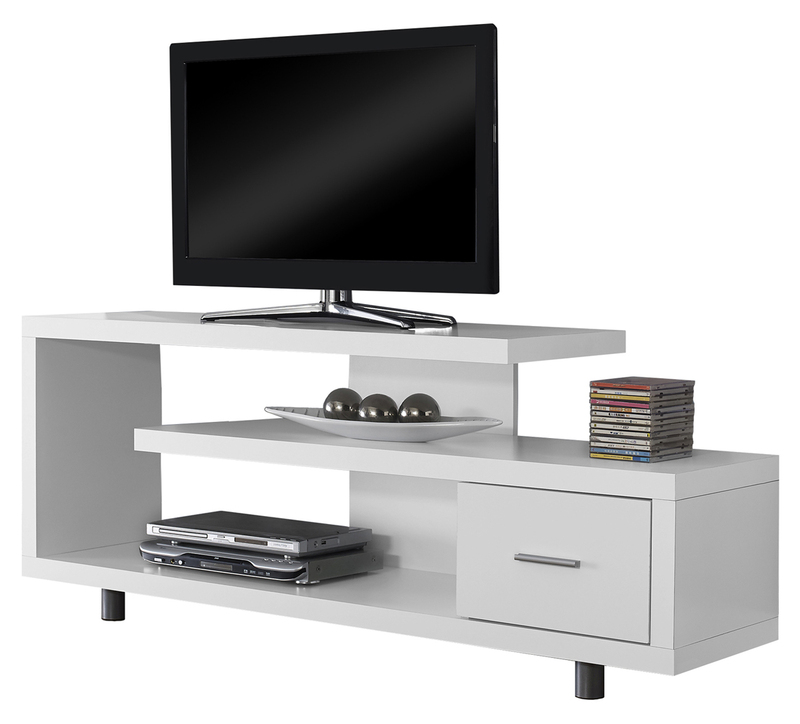 Enhance the look of your contemporary living space with this corner concept TV stand. 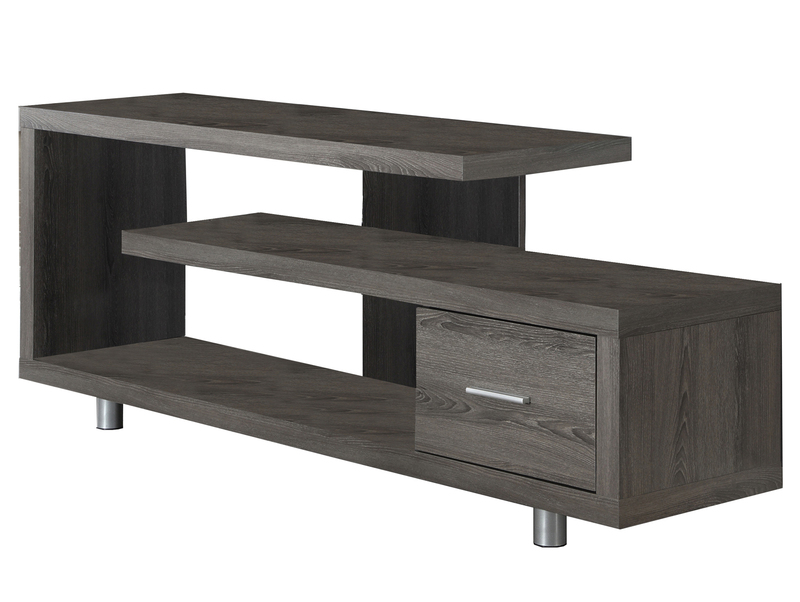 Constructed with thick panels in a modern grey finish, this tv stand can be used against any wall or will perfectly fit into a corner as a great space saving solution. 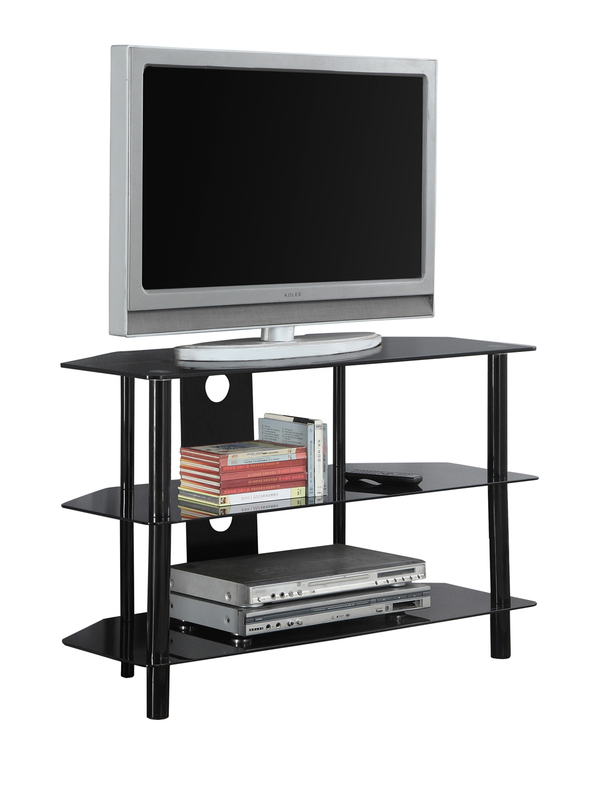 With open concept shelves ideal for your media storage needs, this tv stand is a must have for any home. Will accommodate up to a 42" flat panel TV. 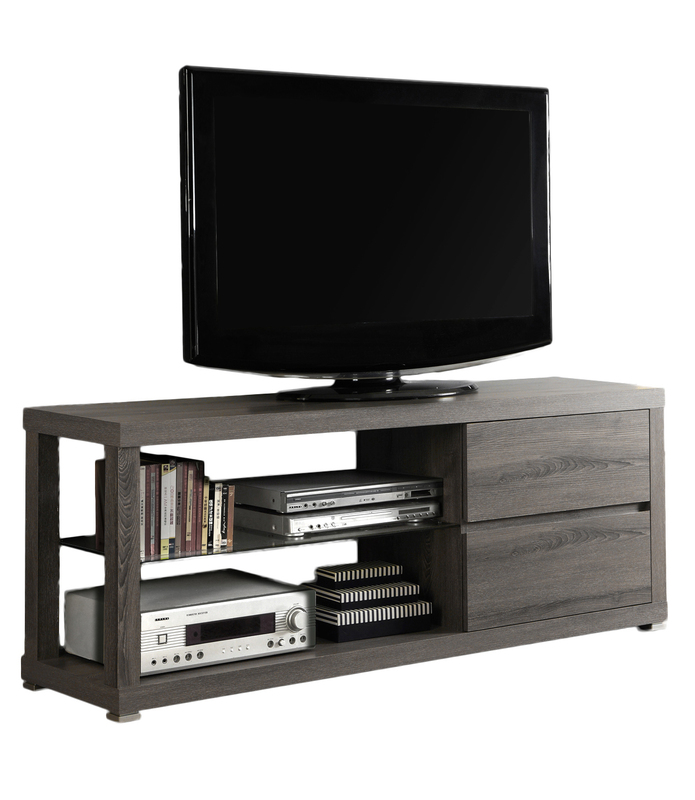 Create a European look to your living space with this contemporary dark taupe reclaimed-look TV console. The thick paneled frame paired with a tempered glass center sliding door, is supported by stylish sleek silver legs. Featuring 4 storage drawers and 4 center shelves, this TV stand will meet all your media storage needs in style. Whether it's time to liven up a room's entire look or you just want to update your entertainment center, this sleek, modern design is a smart choice. This stand features three open, tempered-glass shelves to help organize your media needs. Ideal for smaller spaces, this stand can be used against the wall or can fit into a corner. 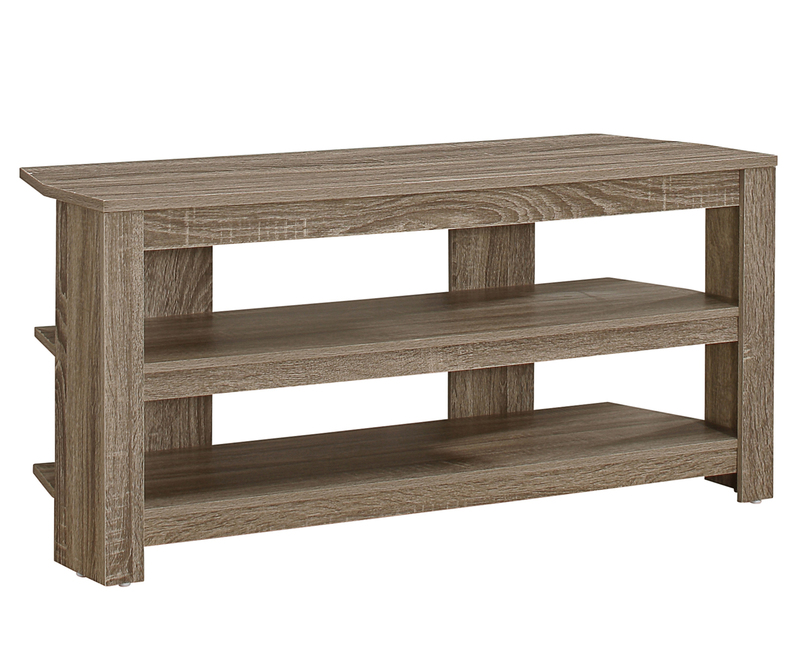 Enhance your living space with this 60" long dark taupe, reclaimed, wood-look TV console. Featuring a chic tempered glass center shelf and 2 generously sized storage drawers this tv console is functional without sacrificing style. Thick panels and clean lines complete the look and make this piece the perfect addition to any home. Enhance the look of your contemporary living space with this corner concept tv stand. 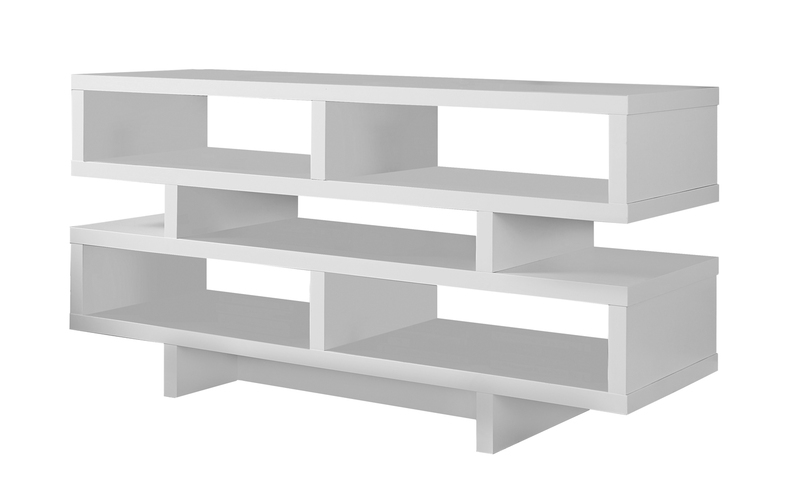 Constructed with thick panels in a modern white finish, this tv stand can be used against any wall or will perfectly fit into a corner as a great space saving solution. 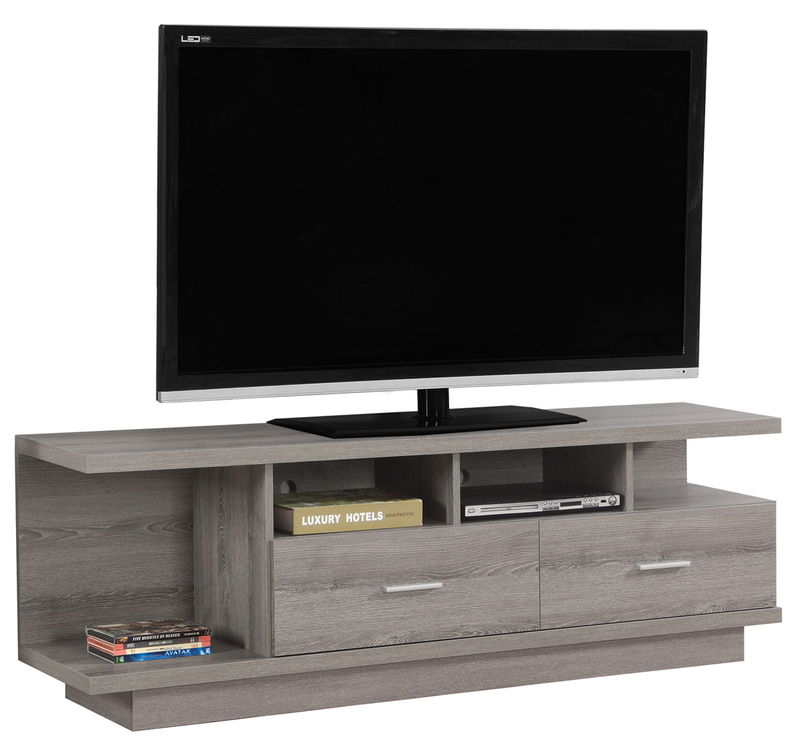 With open concept shelves ideal for your media storage needs, this tv stand is a must have for any home. Will accommodate up to a 42" flat panel TV. 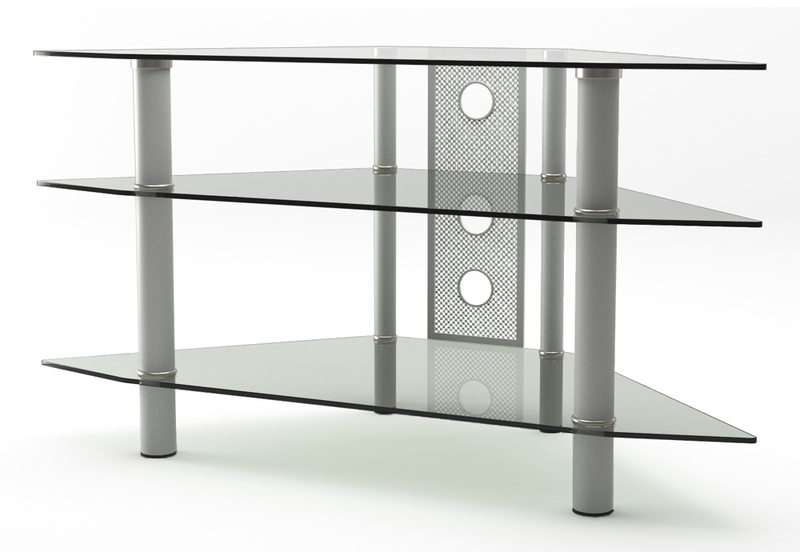 This contemporary TV stand offers a stylish, silver modern design, crafted from durable metal tubing and thick tempered safety glass. Three levels of shelving provides ample storage space for a variety of A/V components and media accessories. 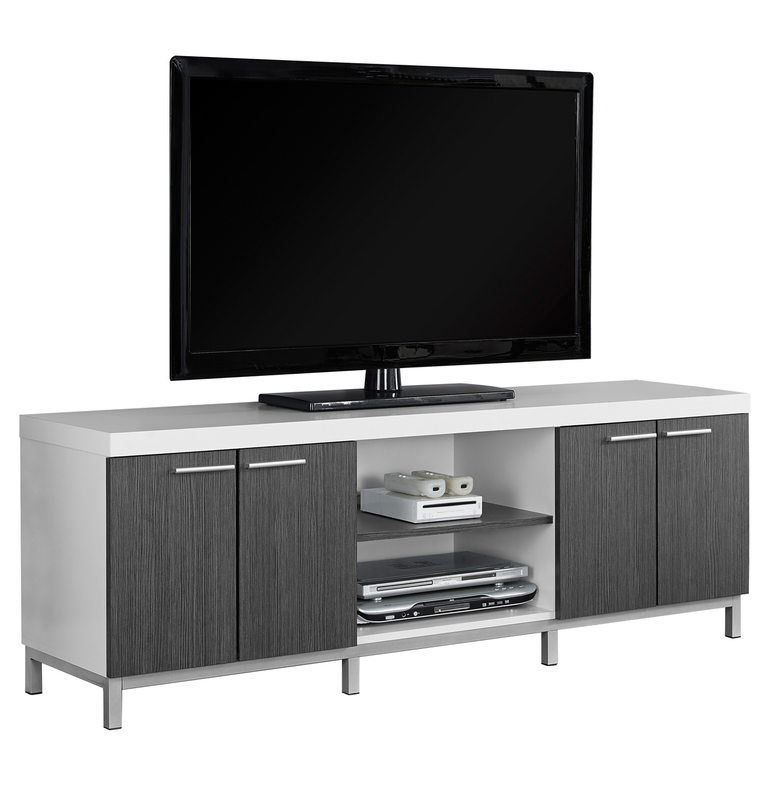 An ideal space-saving corner design with style, this unit accommodates most TVs up to 48 in. All glass shelves are securely fastened offering solid construction without compromising style. Constructed from thick hollow-core, this cappuccino tv console will make a great addition to your home. 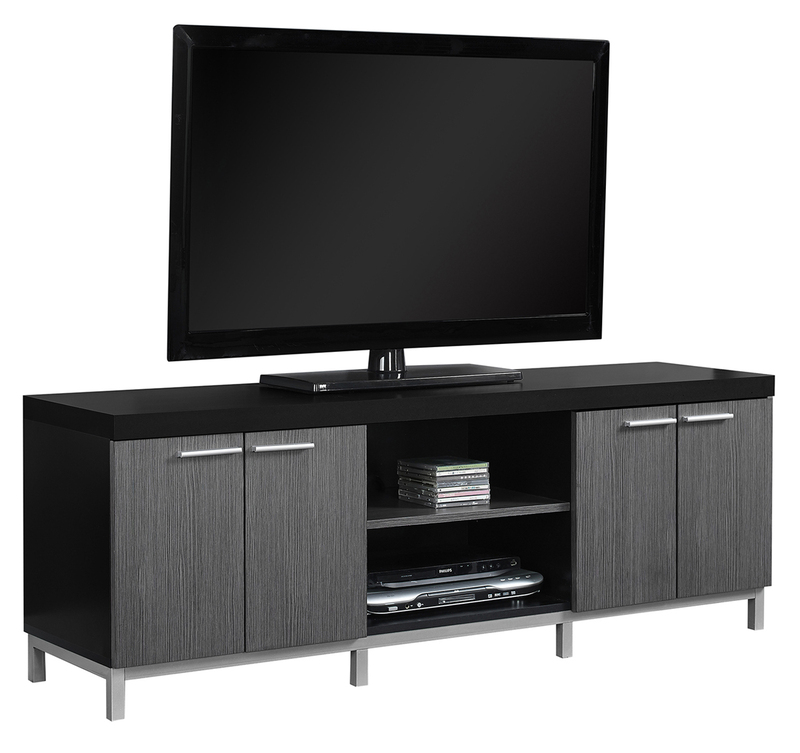 Accommodates up to a 47" flat panel TV and component storage. Enjoy the contemporary styling of the rich cappuccino finish and chrome support rods. 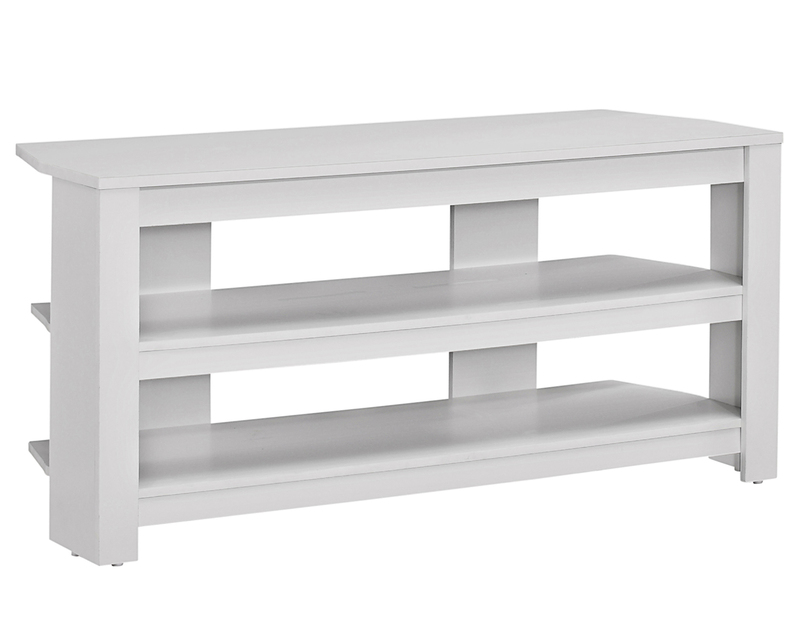 Create a European look to your living space with this contemporary bright white TV console. The thick paneled frame paired with a tempered glass center sliding door, is supported by stylish sleek silver legs. Featuring 4 storage drawers and 4 center shelves, this TV stand will meet all your media storage needs in style. Complete your home decor with the simple contemporary elegance of this dark taupe reclaimed-look TV console. With ample surface area that can accommodate up to a 60" flat panel tv this piece will add style and functionality to any living room. Featuring 2 large storage drawers for DVDs, CDs or other AV accessories and 4 open concept shelves perfect for your electronic components this unit is sure to keep you organized in style. Sleek silver colored drawer handles finish off the modern look that makes this console a must have in any home. 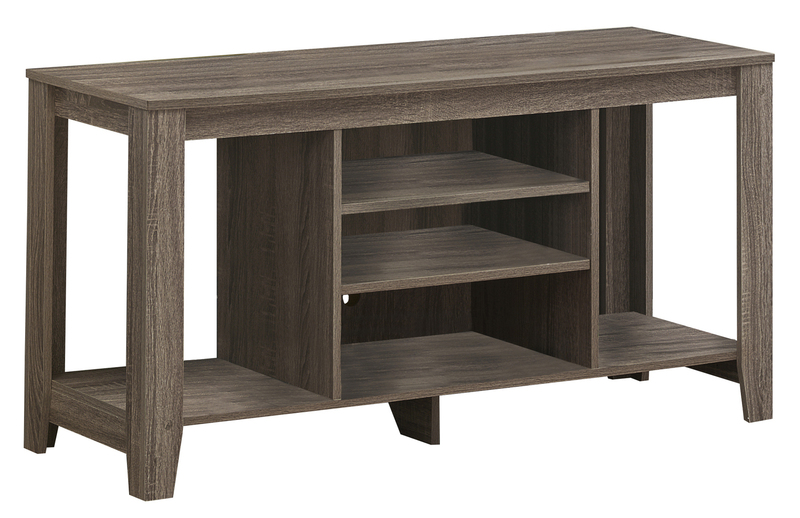 Elegance and function combine to give this contemporary brown 52 inch wood TV stand a striking appearance. This design creates a stylish, modern-look crafted from high-grade MDF and durable laminate that accommodates most flat-panel TVs up to 55 in. Adjustable shelving behind tempered safety glass-paned doors provide ample storage space for A/V components. Two swinging cabinets provide additional storage for books, DVDs, CDs and more. Solid and sturdy supports 250 lbs. Accommodates most flat-panel TVs up to 55 in. 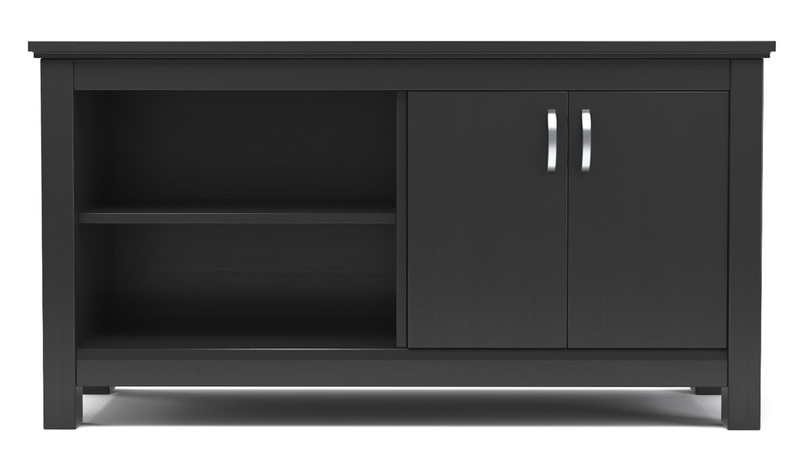 This vast, modern black TV stand features spacious shelving and accommodates most TVs up to 65 inches. It's multi-purpose shelving provides ample storage space for a variety of A/V components and media accessories. Constructed of powder-coated metal legs with a scratch-resistant finish are securely fastened to tempered safety glass shelves. 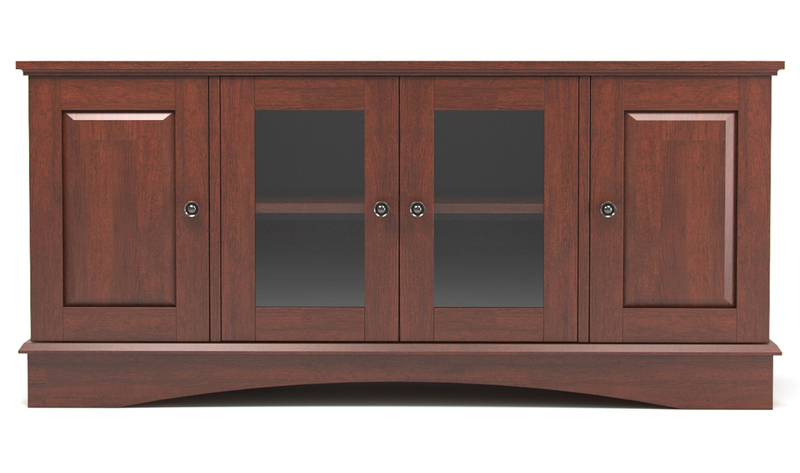 This distinctive look offers a sturdy, durable design that is a perfect addition to any entertainment room. Top shelf supports up to 250 lbs. 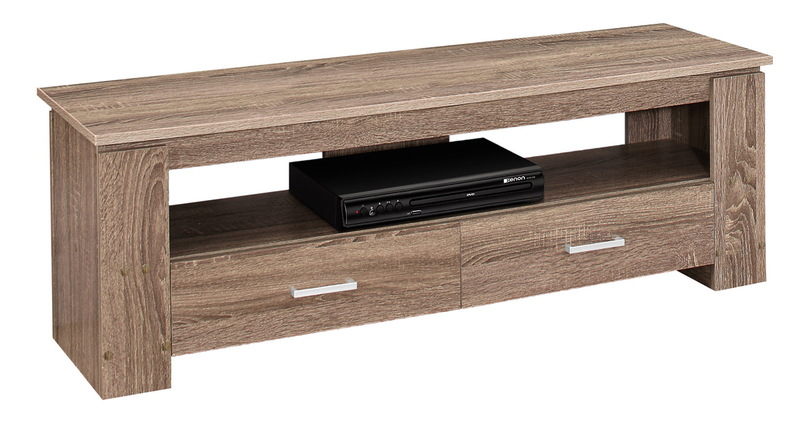 Elegance and function combine to give this brown corner TV stand a striking appearance. 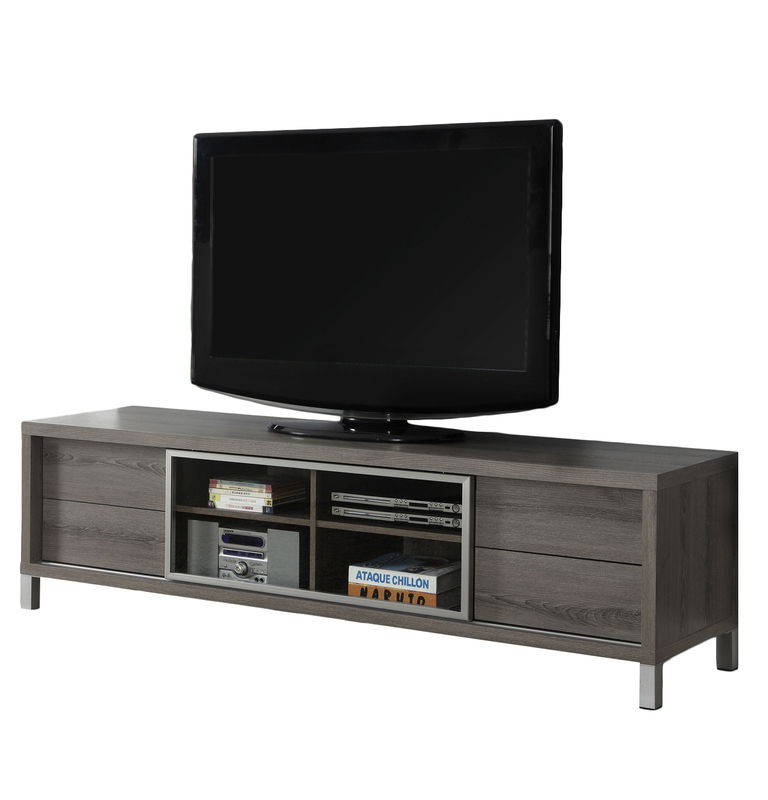 Crafted from high-grade MDF and durable laminate, this brown TV console accommodates most flat-panel TVs up to 52 inches. Console features ample storage space for A/V components and media accessories behind attractive double doors with tempered, safety glass panes. A stylish look with an ideal space-saving corner design. Accommodates most flat-panel TVs up to 52 in. 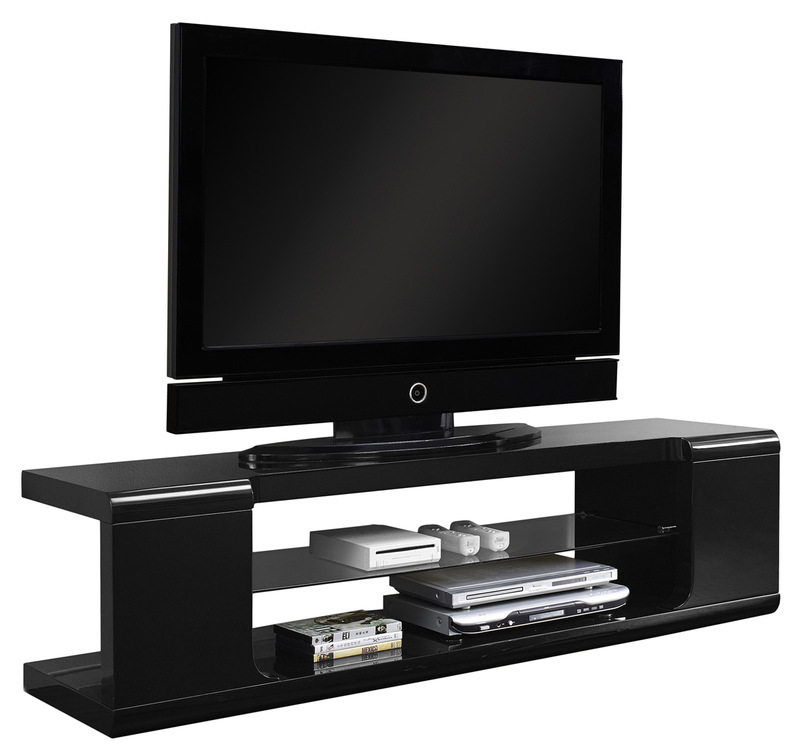 Elegance and function combine to give this black wood TV stand a striking appearance. This design creates a stylish look crafted from high-grade MDF and durable laminate that accommodates most flat-panel TVs up to 52 in. Ample storage space for A/V components and other media accessories with adjustable shelving and cabinet. 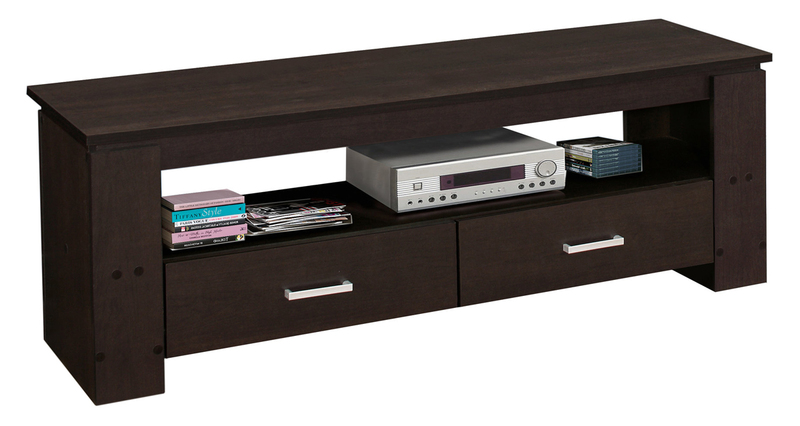 Elegance and function combine to give this black wood TV stand a striking appearance. This design creates a stylish look crafted from high-grade MDF with a durable laminate that accommodates most flat-panel TVs up to 52 in. Ample storage space for A/V components and media accessories with center shelf and double-door storage. 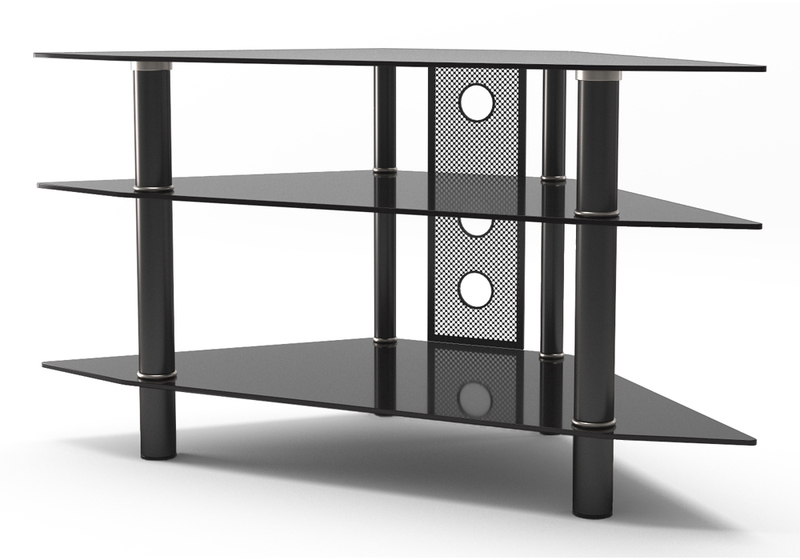 This contemporary TV stand offers a stylish, black modern design, crafted from durable metal tubing and thick tempered safety glass. Three levels of shelving provides ample storage space for a variety of A/V components and media accessories. 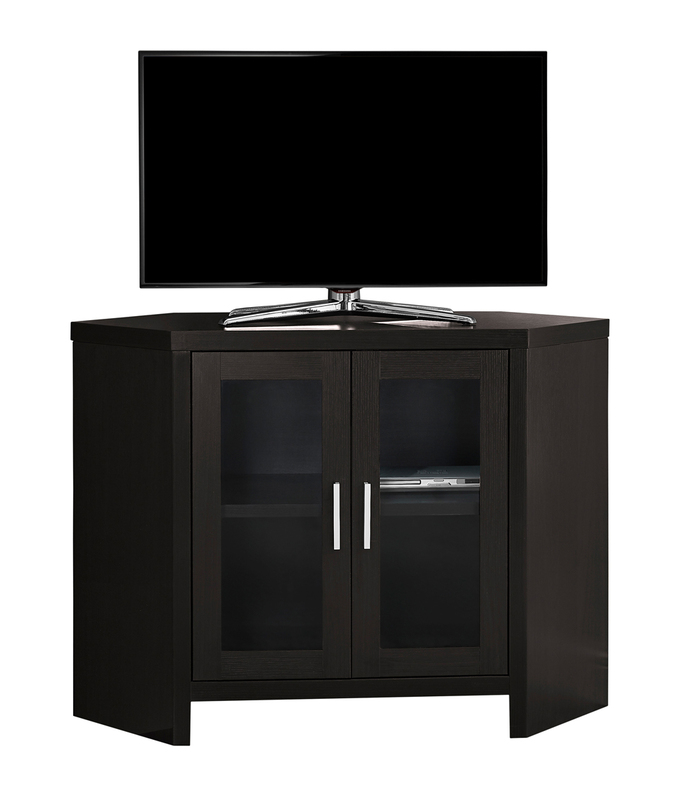 An ideal space-saving corner design with style, this unit accommodates most TVs up to 48 in. All glass shelves are securely fastened offering solid construction without compromising style. Complete the look of your living space with this contemporary two tone TV console. The thick paneled bright white frame paired with grey cabinets are accented with sleek silver colored handles and supported by stylish silver legs. Featuring two open storage shelves and two double door cabinets, this TV stand will meet all your media storage needs in style. Bring a modern statement to your living room, family room, or den with this sleek thick panelled TV stand in a smooth cappuccino finish. The roomy top surface can easily accommodate any TV size with a center stand, and a long open shelf space underneath to place audio/visual equipment and gaming accessories. The 2 large gliding storage drawers accented with sleek silver colored handles, are perfect to keep books, cd+s, dvd+s, or media components neatly in one place. Watch this contemporary TV console unit instantly upgrade your entertainment space! Full assembly instructions are included. 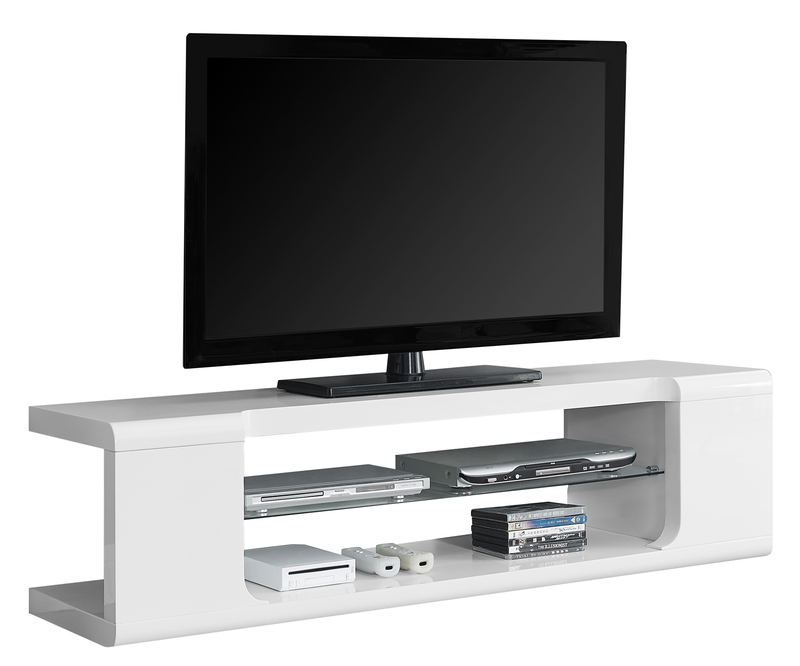 Complete your home décor with the simple contemporary elegance of this bright white TV console. Featuring 4 spacious storage drawers for your entertainment accessories and 2 open storage shelves for your electronic components, this piece is the perfect blend of fashion and functionality. Sleek track metal legs and silver colored drawer handles provide a modern look that makes this console a must have in any home. Bring a modern statement to your living room, family room, or den with this sleek thick panelled TV stand in a smooth dark taupe wood-look finish. The roomy top surface can easily accommodate any TV size with a center stand, and a long open shelf space underneath to place audio/visual equipment and gaming accessories. The 2 large gliding storage drawers, accented with sleek silver colored handles are perfect to keep books, cd+s, dvd+s, or media components neatly in one place. Watch this contemporary TV console unit instantly upgrade your entertainment space! Full assembly instructions are included. 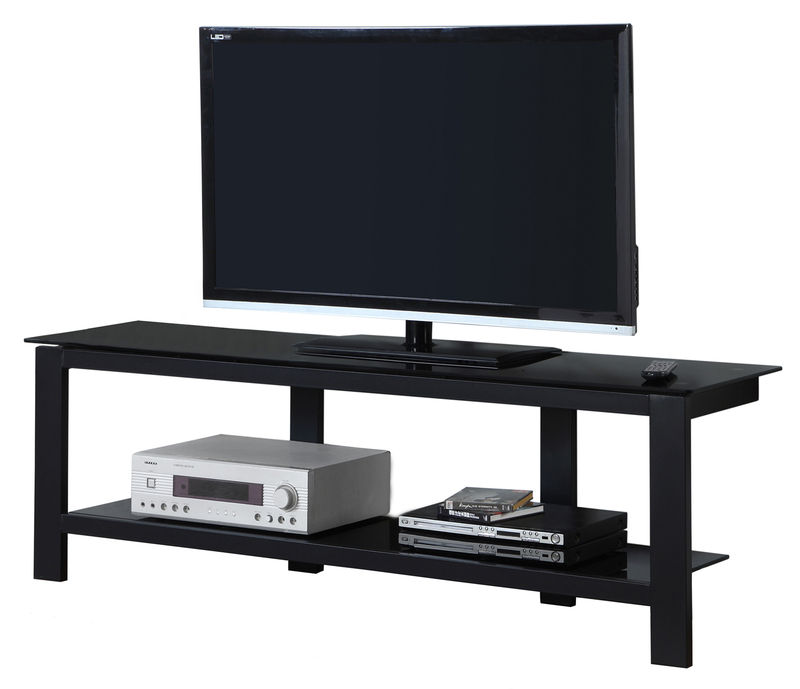 This 42"L corner TV stand is a modern and versatile addition to your home entertainment setup. Fitting nicely into a corner, it will free up valuable floor space and open up your living room making it the perfect space saving unit. Electronic components and accessories are kept organized in style behind two glass cabinet doors with a fixed shelf. Finished in a chic dark taupe that will blend well with any decor this tv stand will be a great addition to any entertainment room. Enhance the look of your contemporary living space with this corner concept tv stand. Constructed with thick panels in a dark tauper reclaimed wood-look, this tv stand can be used against any wall or will perfectly fit into a corner as a great space saving solution. With open concept shelves ideal for your media storage needs, this tv stand is a must have for any home. Will accommodate up to a 42" flat panel TV. Modernize your space with this contemporary black metal tv stand. Featuring a solid 60"L surface and a bottom storage shelf both made of thick, durable tempered glass this console fits perfectly with any design to showcase your collectibles. This piece can easily match with any living space and gives a clean, sophisticated look while you entertain your guests. 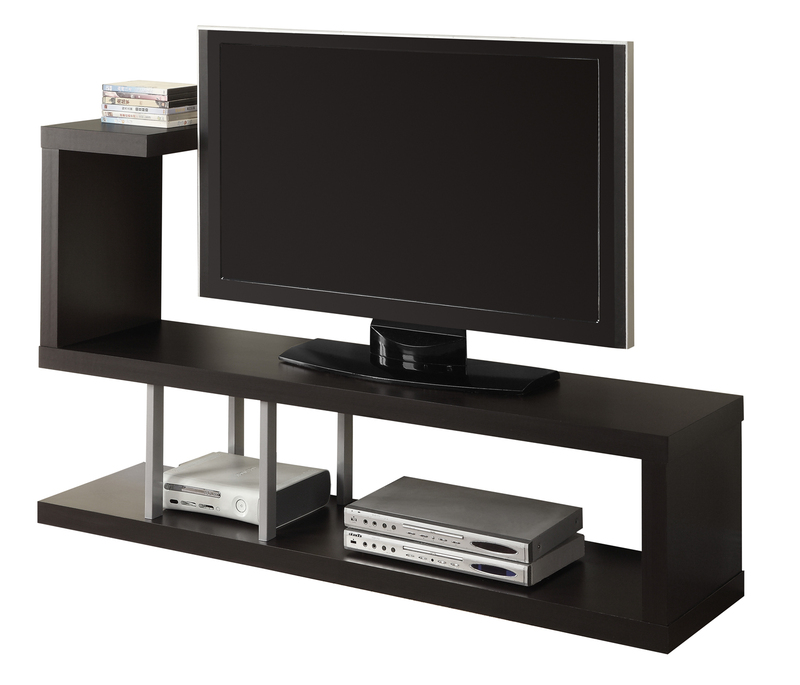 This 42"L corner TV stand is a modern and versatile addition to your home entertainment setup. Fitting nicely into a corner, it will free up valuable floor space and open up your living room making it the perfect space saving unit. Electronic components and accessories are kept organized in style behind two glass cabinet doors with a fixed shelf. Wrapped in a warm cappuccino finish that will blend well with any decor this tv stand will be a great addition to any entertainment room.